A child watches the sky in changing seasons and in all kinds of weather and learns to listen to its voice. In What Does the Sky Say? 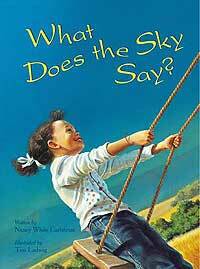 author Nancy White Carlstrom's imaginative and poetic text encourages all readers, both very young and older, to wake up to and participate in the opportunities for joy and learning each day offers. And Tim Ladwig's extraordinary illustrations perfectly capture the moods of weather and season, the magic of childhood, and our deep connection to all creation and its Creator. "What does the sky say?" or its mouth is full of moon?